Business owners do not want to run into cash flow problems while running their businesses. It can hold up payroll, delay paying debts, and ruin a company’s reputation. Tracy and Tracy (2012) posit that when suppliers and creditors find out about cash problems, a company’s credibility tends to drop. Running out of cash is not just a life changing event for an organization it can be the end of a company’s life (Tracy & Tracy, 2012). 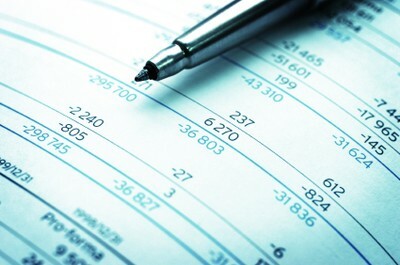 To prepare a statement of cash flow the re-arranging of data provided on a company’s balance sheet is required. A balance sheet must always balance out; cash flow statements, in the meantime, provide data about cash receipts and payments to the company and how they relate to the company’s operations, investments and financing activities. Fraser and Ormiston (2010) explain that the company’s balance sheet reflects bookkeeping totals at the end of an accounting period and that cash flow statements use those balances to identify changes during that specific accounting period (Fraser & Ormiston, 2010). In short, cash statements calculate all the changes that occur in the balance sheets by segregating the cash inflows and outflows and are used as a tool to analyze a firm’s operating, financing, and investing activities. Net income differs from operating cash flows for various reasons. One reason includes non-cash expenses that occur from the depreciation and amortization of intangible assets. 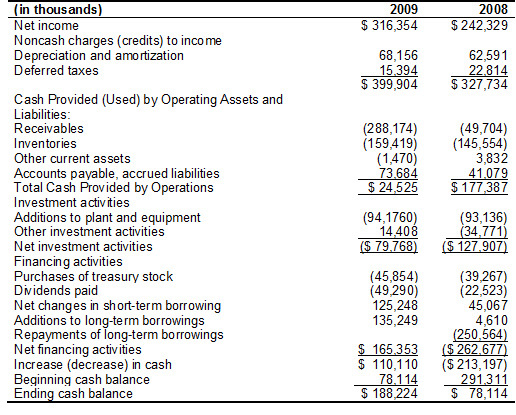 To illustrate these concepts we will examine the Techno Company’s cash flow statement for the 2008 and 2009 accounting period (pictured above). The statement reports net income figures of around $242 (in the thousands) for 2008 and $316 in 2009. However after including depreciation, amortization, and deferred taxes those balances elevated to around $328 in 2008 and $400 in 2009. This is because depreciation and amortization do not require cash outlays and are considered indirect methods of calculating cash flow. In other words, they reduce income, but have no effect on net cash flows. Another reason net income differs from operating cash flows is due to the various time differences that exist between the recognition of revenue and expense, as opposed to the actual occurrence of cash inflows. For example, in examining Techno’s cash flow activities, the 2009 accounts receivable figures reveal an increase from the 2008 figures and are calculated as deductions. This indicates that further revenue from sales was included in the net income figures than had been collected from consumers in the form of cash. Another reason the net income figures are different from operating cash flows is because of the non-operating gains and losses that are also calculated into these figures. In this respect, the related cash flows are recognized as a result of the investment and financing activities, and not from operating activities. Techno’s cash flow amounts shows that their gains have been deducted from the net income amounts and that their losses were added to the net income figures to determine their operating cash flows. 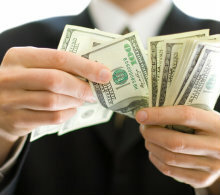 Cash managers today must know how to extend credit and collect cash efficiently. Frielob and Plewa (1995) suggest that today’s cash managers must not only deal with the traditional areas of collection and disbursement, they are also immersed in the company’s investment decisions, banking relationships and forecasting. In other words, they are closely scrutinized and judged on how well they manage a company’s earnings and cash flow (Friedlob & Plewa, 1995). In examining Techno’s cash flows for years 2008 and 2009, we can see that during this accounting period the company generated enough cash from operations to cover their investing activities and they increased their cash account by 141%. This reveals an effective cash management system that exhibits the firm: (a) was capable of generating future cash flows, (b) was able to meet their cash obligations, (c) successfully produced and managed their investments, and (d) had effective financing and investment strategies. In analyzing Techno’s financial and cash flow statements we can assess the solvency of the business to help us evaluate their ability to generate positive cash flows that pay their dividends while they continue to experience financial growth. Friedlob, G., & Plewa, F. (1995). Understanding cash flow. New York, NY: John Wiley & Sons, Inc.
Tracy, J., & Tracy, T. (2012). Cash flow for dummies. Hoboken, NJ: John Wiley & Sons, Inc.
Life is all about adventures and sharing them … so thank you for sharing your adventures! I bet your little ones will always check the inside of shells from now on!